Auckland, 1 June 2013 - At a time when prime office vacancy is so low on Auckland’s North Shore that developers are now starting to build speculative offices again for the first time in many years, a new first floor office space and a café are being created for lease at 5 The Warehouse Way. Marketed by John Bedford, Blair Chandler and Matthew Barnes of CBRE on behalf of Prudentia Investments, an office area is being constructed above the existing office building, which was originally built to accommodate a first floor above, while the café is being constructed on the ground floor. Chandler says that target companies for the office space include companies looking for prominent neighbours. “This building is in a prestigious, fully-leased office park. Any company that takes space here will be in the company of renowned corporate tenants that include Canon, Orcon, Samsung and The Warehouse. Occupying a 5449 sq m site on The Warehouse Way, the 1436 sq m ground floor office building was designed and built for Sony by Auckland property development construction firm Haydn & Rollett in 1999. Haydn & Rollett, whose headquarters are next door at 1 The Warehouse Way, has been in business since 1946. The company sold the building to Sony and then bought it back in 2012 when Sony moved to Ponsonby. The existing facility includes roller door access and a large loading bay, plus generous parking space for 108 cars, designed to anticipate two-storey office and café patron requirements. Matthew Barnes says that the original, single-level standalone structure was built with a number of features to anticipate and enable future first-floor development of 1305 sq m, taking the total space up to 2741 sq m. “Haydn & Rollett always intended to put another floor on top, which is very rare. As a result, they built a concrete roof, mounting plates in the structure and space in the ground floor structure for a central staircase, to enable a quick and effective transition to a two-storey facility. “Now that the ground floor has a new tenant in place – Debitsuccess, the biggest full service payment processor across Australasia - on an eight year lease term that starts on 1 November, construction is now underway on the creation of the steel portal frame. Barnes adds that current work also includes the creation of a 104sqm ground level café. “The commercial café has been consented, but an operator is yet to be selected. We are going through this process now. Final specifications can be customised to the café tenant's requirements, so I urge any operators who are interested to talk to us now. 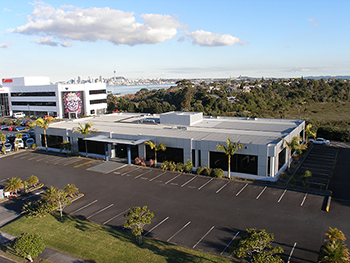 Situated in the Akoranga Business Park, 5 The Warehouse Way constitutes corporate-scale offices with a unique attitude to the CBD, says John Bedford. “On the brow of the Akoranga knoll, this site has splendid views of Northcote, Takapuna, Auckland Harbour and the CBD cityscape. This is a business precinct without the high-rises or traffic congestion normally associated with corporate offices. “There’s real prestige in this location, in which tenants will rub shoulders with executives from Samsung, Canon, Orcon, Macmillan Publishers and Datacom, particularly as they are likely to be coming to the café in 5 The Warehouse Way. Bedford says that the location offers central Auckland location advantages while being on the fringe of the CBD. “Access to the city is relatively easy from this location, taking ten minutes maximum, as occupants will usually be driving counter to the main traffic flows to the city and Ponsonby. Chandler says that a comparison to other similar fringe locations reveals that 5 The Warehouse Way is well-priced for its design, build and amenities. “Total occupancy costs - not just the face rent, but car parking and operational costs too - represent great value for a modern corporate office facility positioned in the heart of Auckland but within easy reach of employee homes, client offices and main transport routes. To underline his point, Chandler points to CBRE’s latest Marketview office research, which reveals that occupiers took up well over 400,000 sqm of office space in the past year. “Our research shows a noticeable increase in demand for new built premises since mid-2012, reflecting the options available within existing stock. In addition, during the past year the amount of vacant office space available to occupiers decreased by 28,500 sqm. 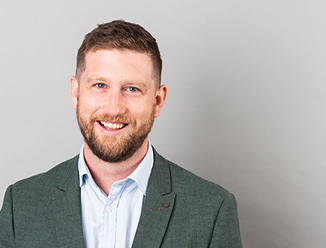 “Occupiers looking for larger prime quality premises are therefore restricted, with low supply and rising occupier activity options will increasingly be constrained over the next 18 months. The opportunity for office occupiers to secure space at cyclically low prices has passed. After allowing for incentives, rents bottomed out in 2010 about 15-25% below their previous cyclical peaks and since then, mainly through decreasing incentives, net effective rents recovered around 35-40% of their losses in most sectors. Given emerging supply/demand trends, rental increases are forecast to continue.